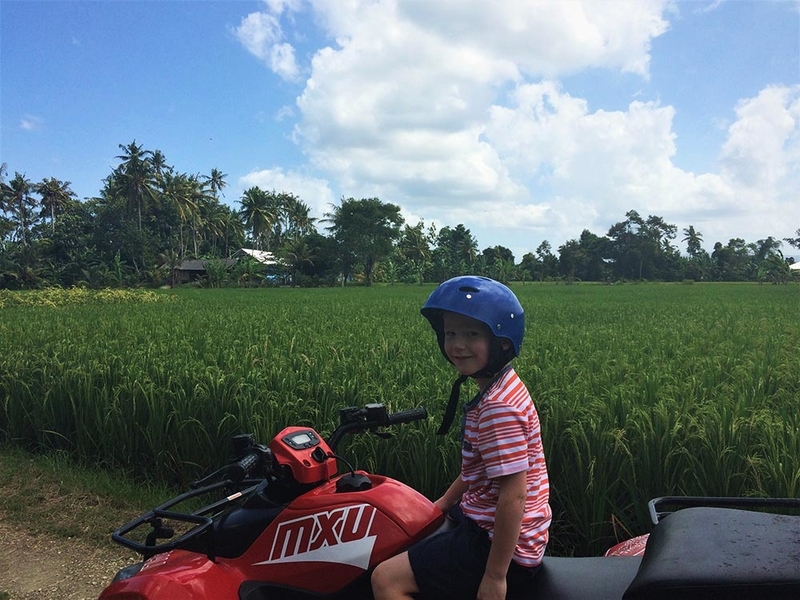 Rated one of the best things to do in Bali – Best family fun in Bali – Great things to do in Bali with Kids By Bali Kids Guide. 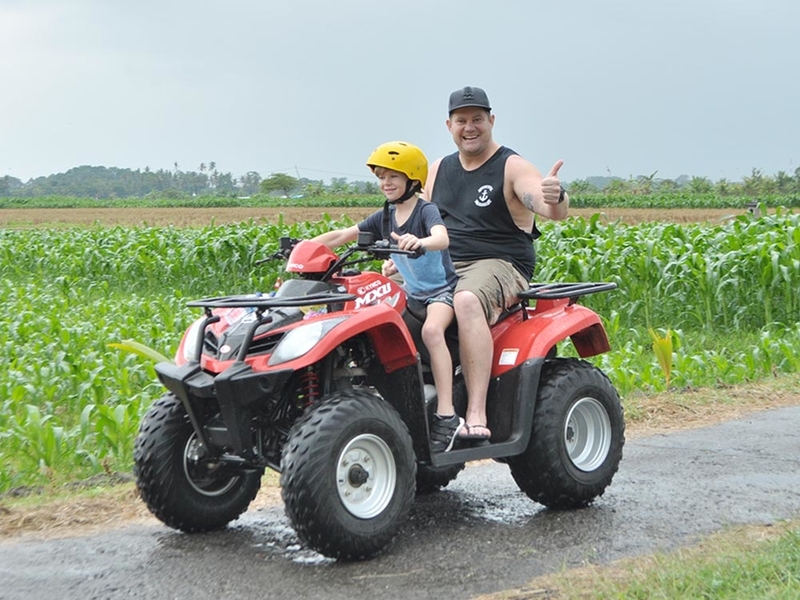 Family Quad Biking – Suitable for all ages – Designed tour for families with young kids. Designed for Families with young kids, this tour is suitable for ages 2 – 65 years, so bring the whole family. Kids can ride with their parents 2 yrs and above, or by themselves 10-12 yrs and above depending on confidence and experience. 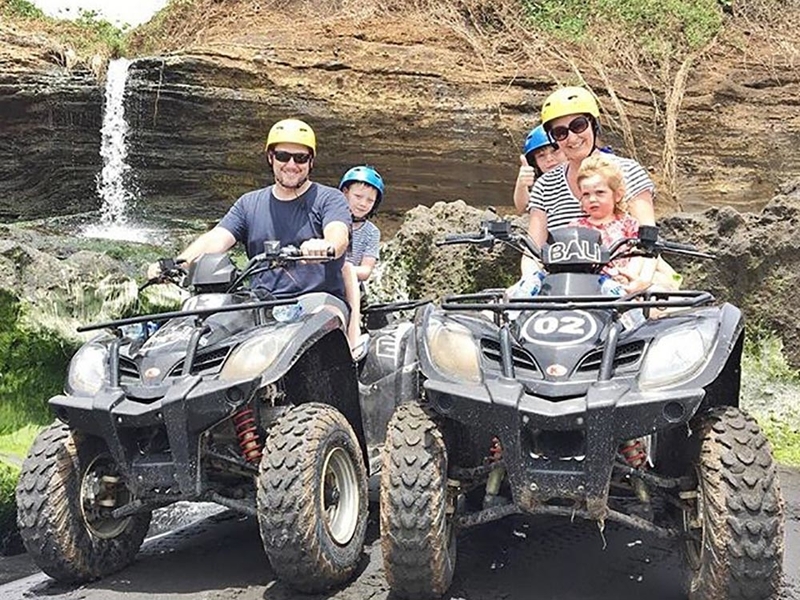 Same place and sights as our ATVs on the Beach, however for the family tour we use tracks that are suitable for families, beginners and all ages. 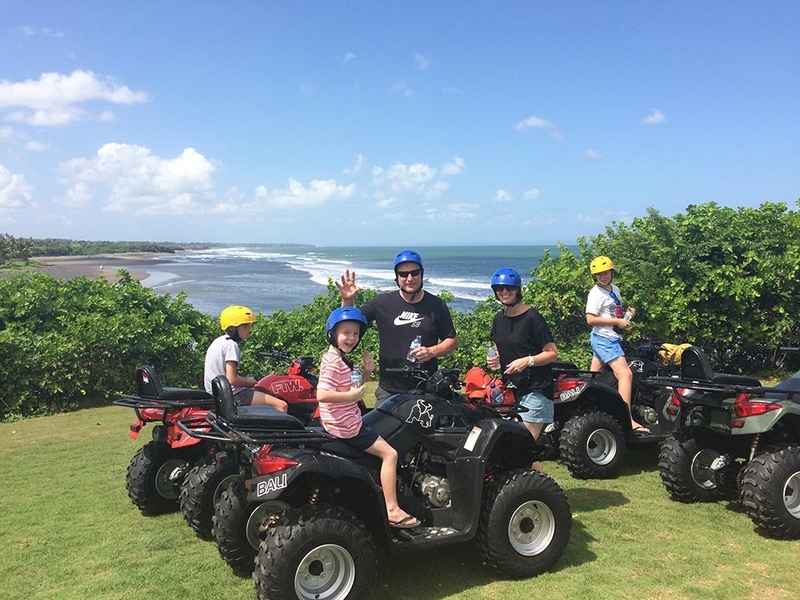 Our world famous Family (Quad Bikes) on the beach, Bali’s one & only fully licensed and permitted ATV tour on the beach. We ride along countless miles of remote black sand beaches, then up through scenic world heritage listed rice fields, jungle tracks and down through traditional local villages then back onto the beach for a final run. Along the way you will see temples built on the beach for local ceremonies, amazing rock formations, river crossing’s, local fisherman, kids and families swimming and bathing in the rivers and lakes along the beach, a bat cave, river streams, local farmers tending their rice fields and local produce, kids playing and riding their bikes along the tracks to the beach, around the local villages kids will run out wave and greet you and if your lucky you will see a local ceremony or other local traditions. Many say it’s the best 2 hours they spent in Bali with amazing scenery and photo opportunities, just check out our video above. This tour offers the best of Bali – you will not experience so much diversity in any other tour. We have alternate tracks to suit your experience and confidence, we have a range easy to operate fully automatic Quad Bikes for beginners up to the experienced. We provide all safety equipment and training, all you need to bring is a sunscreen and a camera. 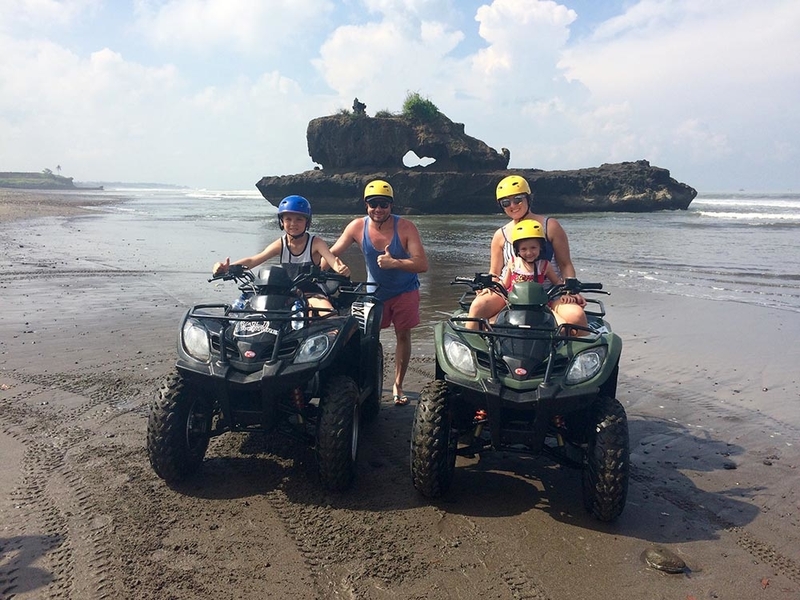 Our site for ATV’s on the Beach, Bali – is in Tabanan Regency, just 15 minutes west of the famous tourist destination Tanah Lot Temple. Depending on the pickup area and traffic conditions its approximately 1 hours drive from Seminyak and Kuta area’s. 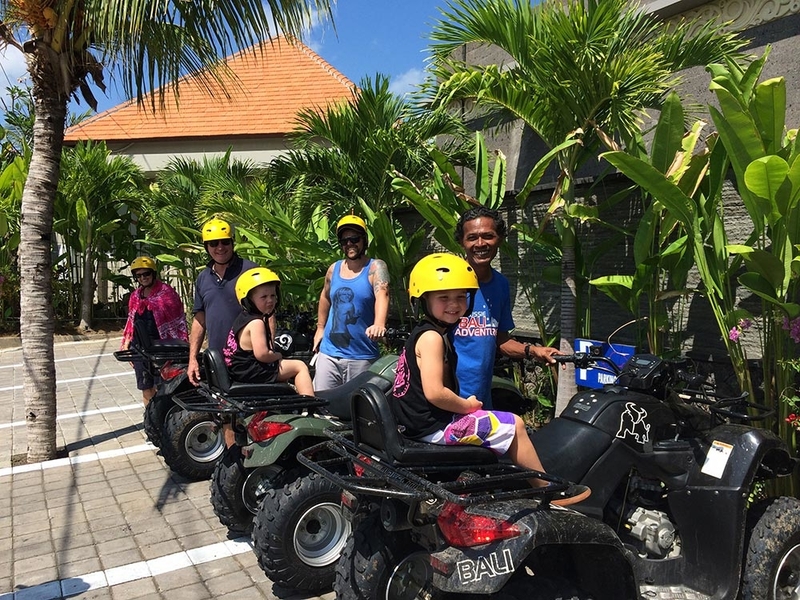 You will be collected by our air-conditioned wifi vans, On arrival there is some paperwork to be completed and you will be advised of our safety rules and how to operate the bikes, then it’s off for the best 2 hours you will spend in Bali. Finish up grab a ice cold soft drink or beer and wait for your all included restaurant meal to be served. Bring with you: Cash for the tour, sunglasses, sunscreen, normal Bali clothing is fine, shoes are better if you have them, if not thongs are ok, change of clothes is optional, we have towels for you. Duration: Tour is 2 hours of actual ride time + photo stops. Including return transfers, training, the ride and depending on time you spend at restaurant or resort allow approx 5 hours for the full trip. Ride + Al Le Carte meal at our Restaurant overlooking the rice terraces. Includes: Return transfers, meal and drink, onsite insurance, all safety gear and training, bottled water, refreshments and photographer options. Group discounts ARE available for groups of 6 pax or more. Pick up times: Morning 7.30am, Middle 10.30am, Sunset 2pm. Includes: Resort entry pass, Pool pass & pool towel, Resort meal, Return transfers, onsite insurance, all safety gear and training, bottled water, refreshments and photographer options. Group discounts NOT available for VIP Tour. Resort rules are maximum 8 persons for the VIP tour per time slot, so it’s first in best dressed. * In booking form notes at the bottom type – VIP tour. 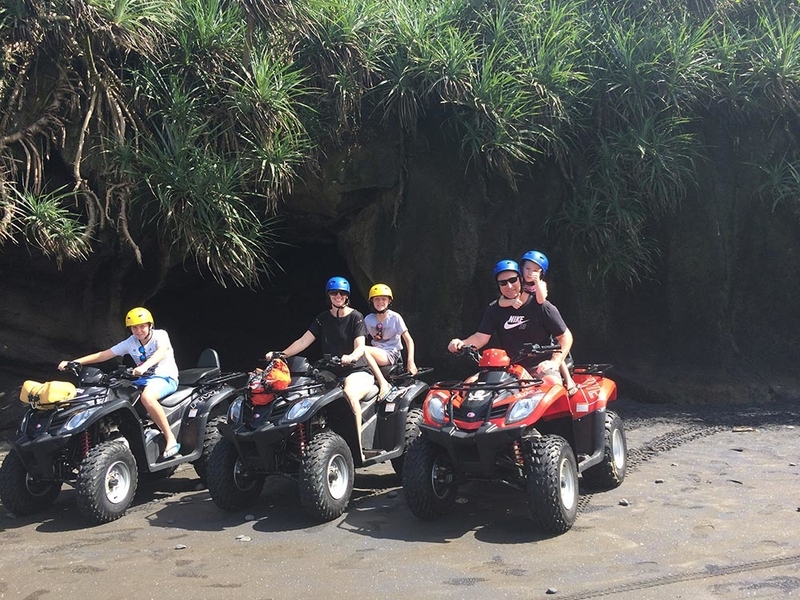 ATV tour + Tanah Lot Temple: Extra 450.000rp per mini van. ATV tour + Tabanan Butterfly Park: Extra 450.000rp per mini van. ATV tour + Tabanan Monkey Temple: Extra 450.000rp per mini van. 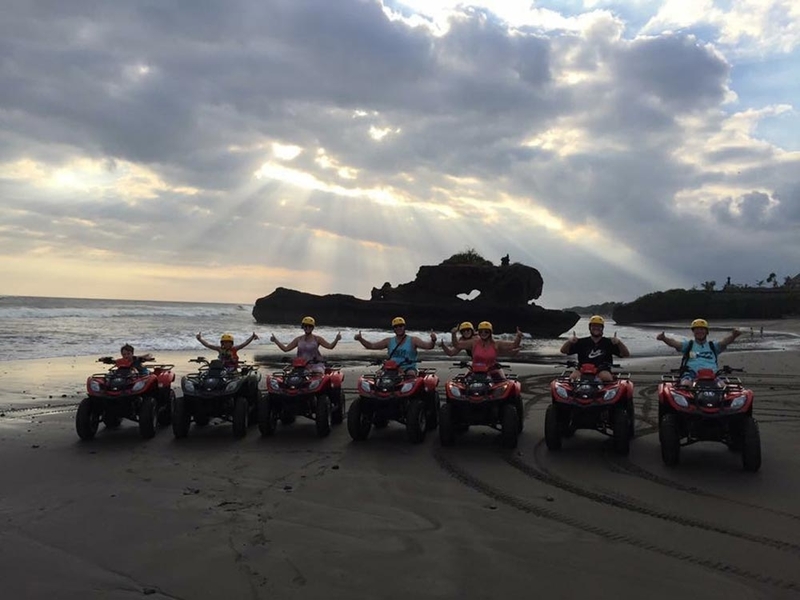 ATV tour + Canguu or Echo Beach: Extra 450.000rp per mini van. 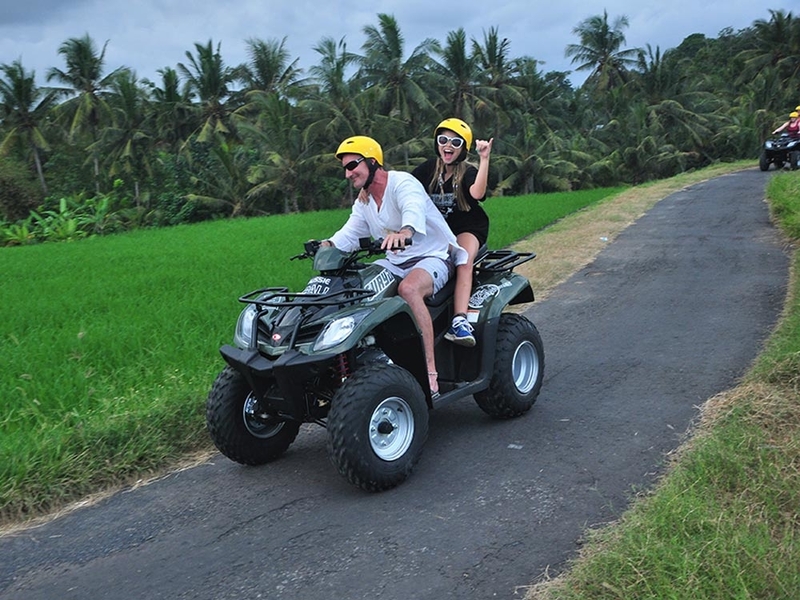 ATV tour + Ubud area’s: Extra 650.000rp per mini van. 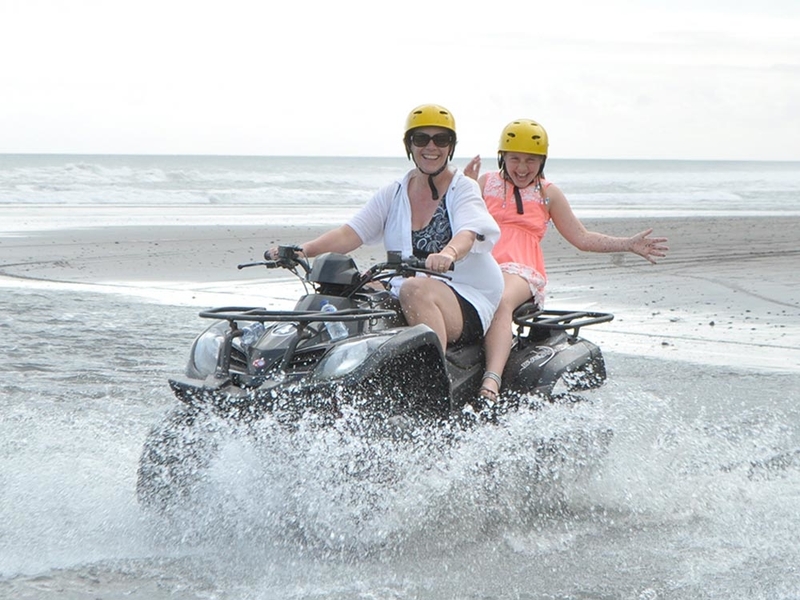 Includes: Your selected ATV tour + driver, guide, fuel and parking expenses. * In booking form notes at the bottom type – sightseeing tour. Pick up times: Morning 7.30am, Middle 10.30am, Sunset on request. Combine with some of our other tours and save $$$,Check out our Combo Deals page. Pick up area’s: Nusa Dua, Sanur, Kuta, Legian, Seminyak , Jimbaran Bay, Ubud, Canggu – outside area’s may incur a small transport fee. Payment: Cash on the day only in RP, AUD or USD – No Credit Card or Eftpos facilities available.